Systems West is ideally situated in the beautiful Willamette Valley between the Pacific Ocean and the Cascade Mountains. The Eugene-Springfield Metro area features easy access to some of the best hiking, biking, kayaking, fishing, SUP, skiing, snowboarding, and wine country. 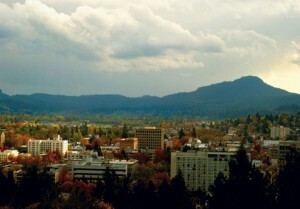 The area claims the name of Track Town USA, is home to the Oregon Ducks and pridefully owns its vibrant personality. Recently ranked #28 by Livability.com’s 2018 Top 100 Best Places to Live, the area offers extensive music and the arts scene, countless restaurants, breweries and vineyards, and lively year-round farmers markets. Our office is located on the corner of 7th and A Street in downtown Springfield, Oregon. We are nestled among numerous lunch spots, cafes and bars, and boutique shops.